There is nothing more essential to the comfort of your home than an efficient HVAC system. Choosing the right system and having it properly installed or serviced starts by selecting a service provider you can trust. Understanding the basics of your heating and cooling system is a great start, but you should also be aware of key questions to ask your service provider to ensure you select the right company for the installation or service. When selecting your service provider, research is key. These service providers are going to be in your home. Make sure they are trustworthy and meet the highest standards by reviewing their credentials, experience and reputation before scheduling an appointment. Check online reviews, the Better Business Bureau and the local license board. Do all of your employees undergo background checks? 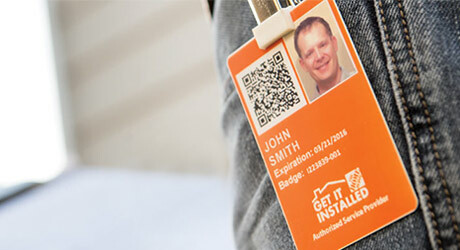 What certifications and training do your professionals and installers undergo? Do you guarantee your work? What’s the resolution process if there’s an issue? What steps do your professionals take to protect floors, clean up after the service, etc.? Finding a reputable service provider is easy when you start at The Home Depot because we’ve done all the research for you. Every professional sent to your home has already gone through a vetting process, including a thorough background check, and wears an official Home Depot Badge verifying their approval status. You’ll be in great hands with our vetted, badged professionals who will get the job done right, and unlike many contractor referral services, your contract is directly with us – not the service provider, so you can have complete peace of mind knowing that all work is fully backed by The Home Depot. Your installation consultation should take 1-2 hours and is intended to provide multiple heating and cooling options based on your family’s needs, your home’s construction and your budget. What are your goals related to saving energy/reducing utility bills? Do you have any problem areas in your home relative to comfort (e.g. hot or cold spots)? Do you have any indoor air quality needs (e.g. family members with allergies or asthma)? Do you have any humidity problems in your home? Are you interested in any “Smart” features that will allow you to control your system remotely? Are there any other concerns such as noise, location of the equipment, etc.? What type of warranty do you want? What is your budget? Are you interested in financing? Once you select a new system, an HVAC professional will work with you to schedule your installation. Most installations can be completed in one day. During the installation, service providers should wear shoe covers and take extra care to protect your home. Following installation, the service provider should provide an orientation to ensure you know how to operate and maintain your equipment and what to do in the rare event that you have any problems or concerns. When your HVAC service provider arrives for a repair or maintenance call, they should begin the appointment by discussing your needs and concerns regarding your comfort and your equipment. Then, your provider should proceed with a system inspection and diagnostic. If repairs are recommended after the assessment, your provider should present you with repair recommendations. Depending on the severity of the issue and the age of the system, they may also give you the option to replace the system. If you choose to repair, most repairs can be done on the spot unless special parts need to be ordered. If you choose to replace, often the diagnostic fee will be credited towards the cost of the new system. This is the case if you are working with a Home Depot HVAC professional. When the service provider leaves your home, it should be returned to the condition in which it was found. All trash should be removed and drop cloths picked up. They should take great care to ensure your floors, walls, doors and baseboards were not harmed during the installation process. If you need a whole new HVAC system or just a repair or maintenance, count on The Home Depot to help with all of your heating and cooling needs. Our professionals are local, licensed, and back-ground checked to ensure that we provide you with the best service and in-home experience. We offer free in-home installation consultations, and offer affordable pricing on repair and maintenance visits. In many cases, emergency repairs can be scheduled same-day or next day. To schedule an appointment, call 800-HOMEDEPOT or enter your information online.